This weekend we had the perfect fall weather. It was cool (and by cool I mean in the 60's) and rainy. It made me long for fall, pumpkin spice lattes, boots, scarves, the whole thing. I know I should probably soak up the last bit of summer, but I'm a total fall girl at heart. 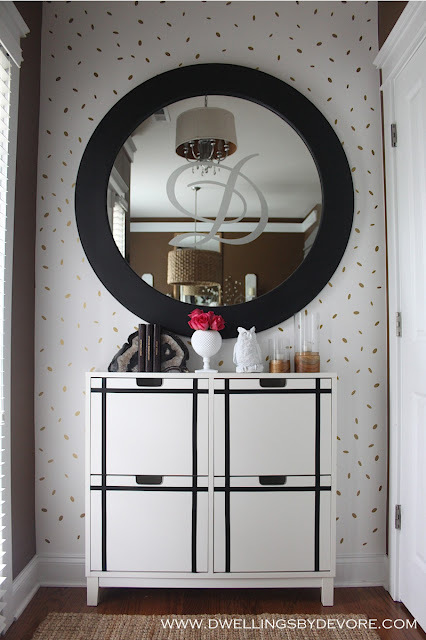 Since it was kind of dreary outside I got inspired to makeover my foyer. It's something I've wanted to do for a while now. I grew tired of the moroccan stenciled pattern. It also felt really dark and I wanted to brighten things up a bit. I plan to keep the brown in the dining room for a while because I don't mind it and honestly the thought of painting over it just doesn't sound appealing right now. So, I made some small changes and it's amazing how much brighter everything feels. It's like a breath of fresh air. This makeover also didn't cost me anything, it was a win win. I pulled out a can of white paint that I used for our downstairs bathroom and got to work. Four coats later I had a blank canvas. I'm not so good at taking progress pictures. Once the wall was painted and dry I used my silhouette machine to cut out small oval-ish shapes from some leftover gold vinyl. I used three different sizes. You could do this by hand if you don't have a vinyl cutting machine. Just cut, peel, and stick. I didn't stick to any particular pattern, I just randomly placed them. I picked up these bookends at Marshall's a few weeks ago. They're cheaper than the Target ones and my local store had lots of different colors. I played it safe with the black and gray ones so they can migrate to other rooms of my house when I switch things up. My parents gave us this ikea cabinet for Christmas last year. We needed something very narrow to fit in this space without interfering with the closet door that is to the right. 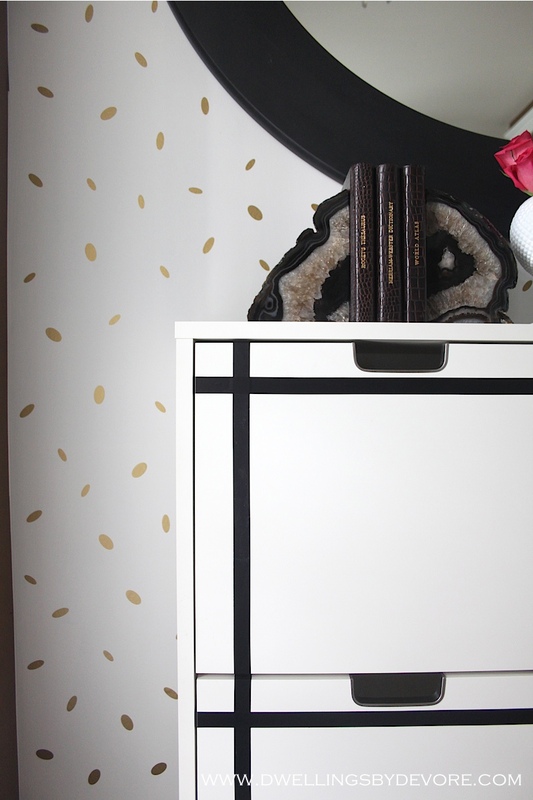 This piece is the perfect size and the extra storage is a bonus. However, it was kind of plain. So, while my paint was drying I pulled out some electrical tape and came up with this pattern. I didn't measure this either, just eyeballed it. I thought about painting it at first, but I like that the electrical tape is easily removed. I'm thinking about moving my fiddle leaf fig down here too because green, black, white, and gold work so nicely together. Plus, it would be a lot easier to just water it outside with the hose. I would love to find a great basket with handles to repot it in. Seen any good ones? I saw one a few at IKEA, but I'm looking for something a little more chunky. Bethany, I adore everything about this! Those gold shapes are absolutely perfect, and hello, electrical tape?! Brilliant. It's all magazine-perfect! 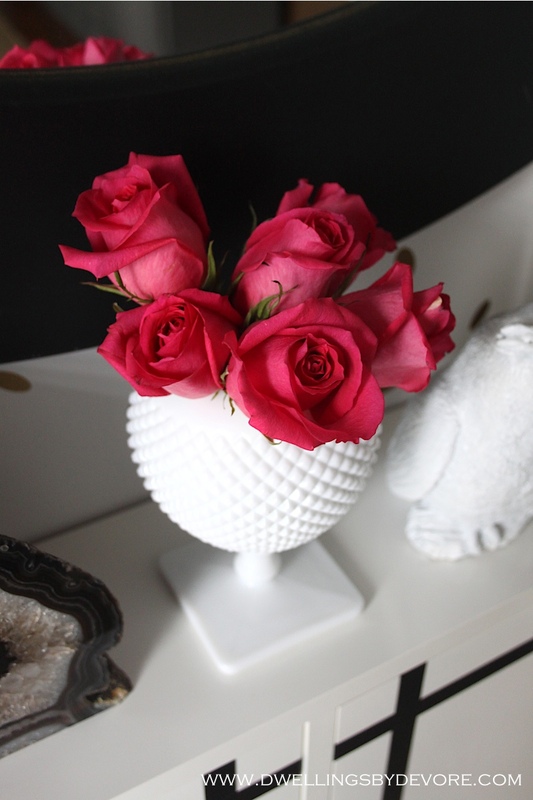 Your walls look amazing and I love your hack! Everything looks fabulous! I know World Market has some great chunky baskets, you might try there. clever girl! it looks awesome! way to hack! Wow! This looks so amazing. I love it! Perfect! I love the whole vignette....perfectly styled! Seriously I love it, it turned out beautiful!! It's perfection!! 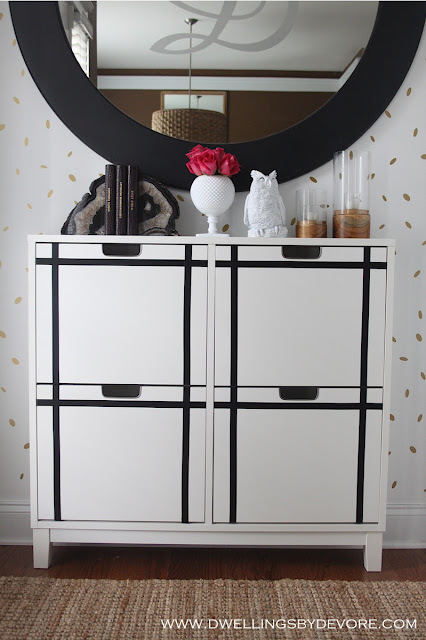 Oh Bethany, it looks SO classy and chic! I love every little detail and can't believe how you just whipped this out! I've been wanting to do a little vinyl project but don't have a Silhouette. Can I just buy sheets of vinyl at Hobby Lobby? 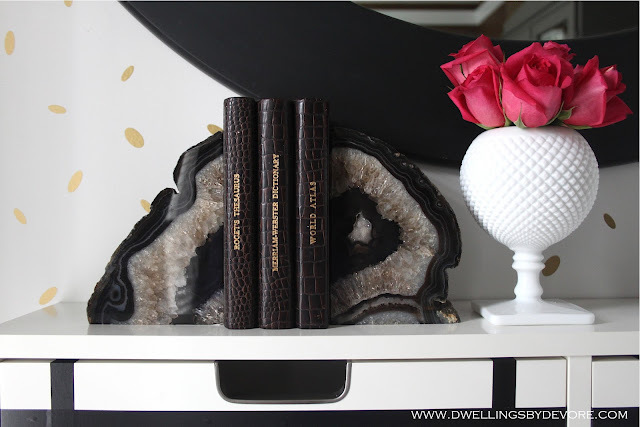 LOVE the bookends, I've had an eye out but haven't seen any at our Marshall's and I also think your candleholders are great! Is that a wood base? TJ Maxx has had tons of good baskets lately! Another win!!! You're on fire chica!! You totally beat me to this, LOL...I want to make some decals of my gold vinyl for my hallway for fall or Christmas. And now that I see yours I can't wait!!! It looks beyond amazing. Like a I said before, down to every detail!!! Thanks so much Julia! Isn't amazing all the things you can use vinyl for? I've used my silhouette so much! 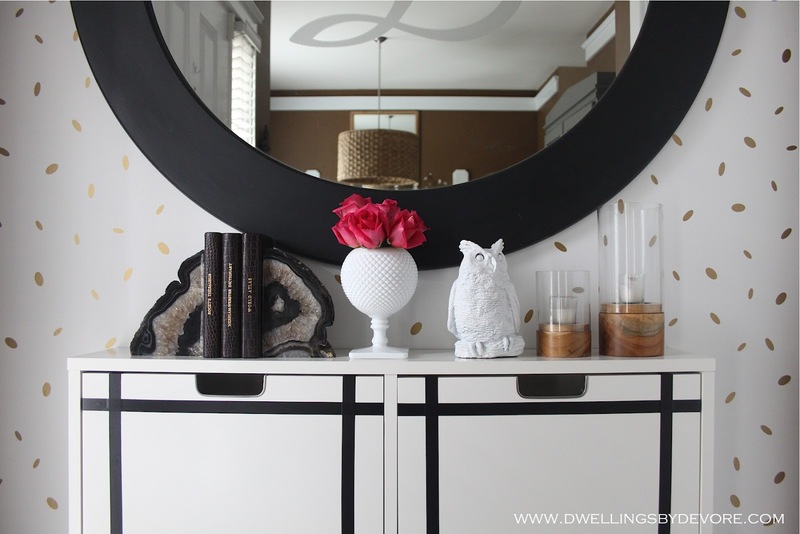 I can't wait to see how your hallway turns out! haha, so are you! Your hallway is looking awesome! Thanks Marty! I'll be sure to check out your party! Thanks Sherry! I'll take that as a huge compliment from you, you are the styling queen! Thanks! 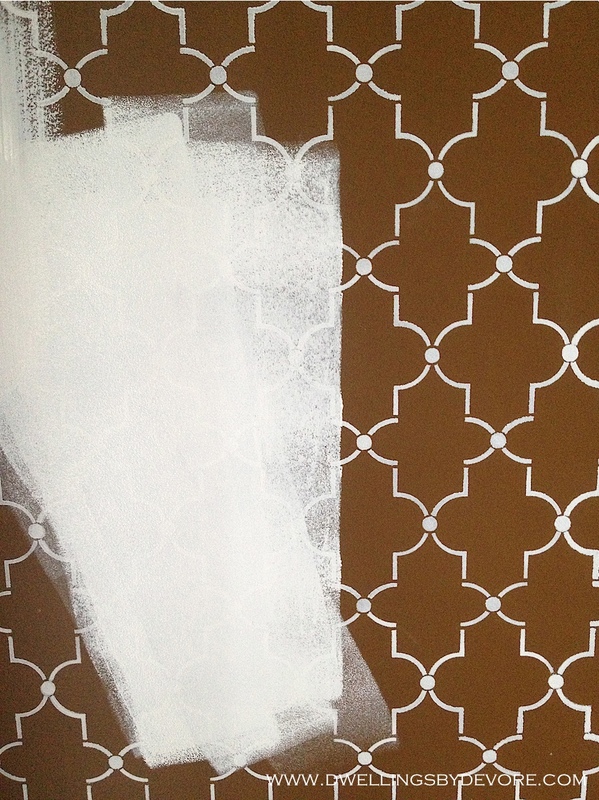 Can't wait to see the full reveal of your stenciling project! Thanks! I was just in there the other day and didn't even think to look, I'll have to check there! Thanks for the heads up! LOVE this! Perfect for rentals too! so pretty! I love it!!!! This is BRILLIANT!! The gold vinly flecks & electrical tape?! Who knew how posh those things could look! So clever. 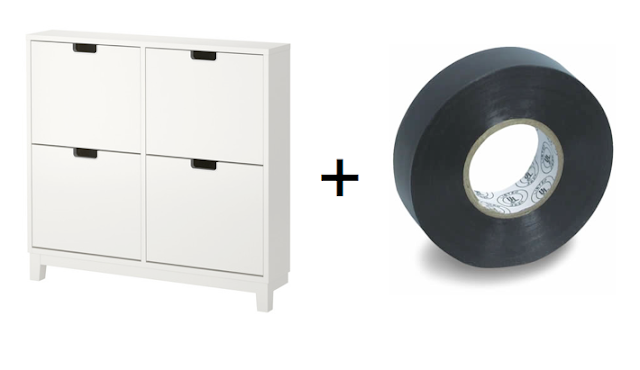 What is the name of the ikea cabinet used? The link is broken. looks stunning! Excellent job! 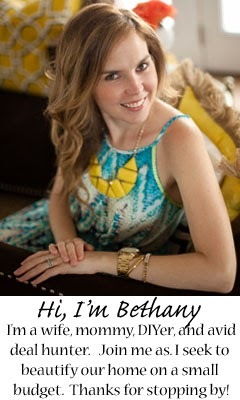 Started following your blog Bethany! I love your convex mirror!